Clemson stunned Alabama in the national championship game as wide receiver Hunter Renfrow hauled in the game-winning score with one second remaining. The touchdown clinched the Tigers' first national title in 35 years. TAMPA — As a taut national title game see-sawed into the fourth quarter for the second consecutive year, so much felt the same for Clemson. There was star junior quarterback Deshaun Watson, blitzing the Alabama defense for 420 passing yards. There was Alabama tight end O.J. Howard, running uncovered down the sideline for a breathtakingly easy touchdown. There was slot receiver Hunter Renfrow, burrowing crevices in Alabama’s defense to cobble together another night for the ages. But one year after a pair of special teams blunders cost Clemson a chance at the national title, this time the Tigers got the ending right. Clemson erased a 10-point fourth quarter deficit, captured its first lead of the game with less than five minutes remaining and then scored with one second left to outlast Alabama, 35–31, and deliver the program its first national title in 35 years. 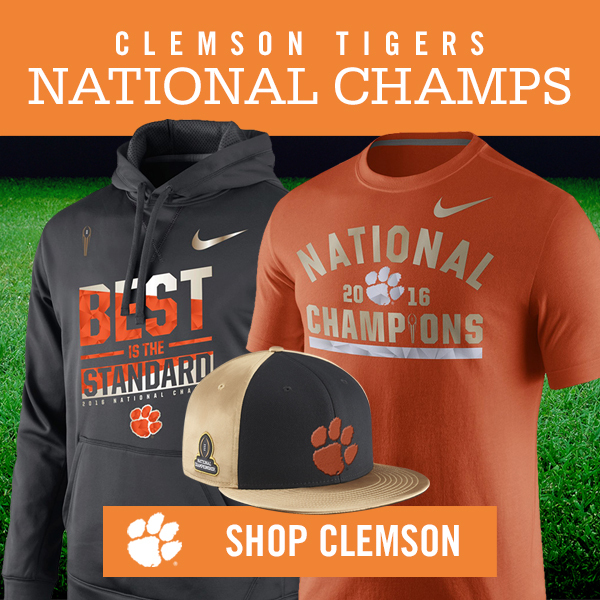 It would be hard to blame Clemson fans if they had visceral flashbacks to last year on Monday night, especially when Alabama leapt out to a 24–14 lead late in the third quarter when Howard wriggled behind the Tigers defense for a 68-yard touchdown catch. But Clemson rebounded twice to show a composure it lacked late in the game last season, as Watson produced two touchdown drives in the final 6:33 and delivered a final salvo for the ages. It ended with Renfrow, the former walk-on, catching a two-yard touchdown with one second remaining to clinch the most thrilling championship game in recent college football history. Renfrow scored on what’s known as a pick play, as Alabama defensive back Tony Brown got screened out of the play by Artavis Scott and Renfrow ran alone to the pylon. Renfrow finished with 92 yards on 10 catches a year after catching seven passes for 88 yards. Alabama entered the night 97–0 under Nick Saban when leading by double-digits in the fourth quarter. The Tide seemed poised to uphold that mark when true freshman quarterback Jalen Hurts authored an impressive six-play, 68-yard drive that culminated with him scoring on a 30-yard touchdown run. But that merely set the stage for Watson, who finished the game 36 for 56 for 420 yards with three touchdown passes. He took over on the Clemson 32-yard line with 2:01 remaining and surgically led the Tigers on one of the most dramatic and impressive drives of the modern college football era. Watson completed his first five passes, spraying the ball to the rangy Mike Williams, the trusty Jordan Leggett and the speedy Artavis Scott. But the game-winning touchdown went to the most fitting target, as Renfrow’s grab will live in college football lore with Vince Young sauntering into the end zone against USC and Kelvin Benjamin snaring a touchdown in the waning seconds against Auburn. The victory marks the first national title for Clemson coach Dabo Swinney, making him the fifth active coach with a national title. He joins elite company with Oklahoma’s Bob Stoops, Ohio State’s Urban Meyer, Florida State’s Jimbo Fisher and Saban. The win caps an epic career for Watson, who finished 32–3 as a starter. Watson committed to Clemson out of Gainesville, Ga., as the top-ranked dual-threat quarterback in the country and dedicated his entire career to lifting Clemson back to the national elite. He is known for his archer-like touchdown celebration of launching a bow-and-arrow. And with that drive, he pierced the soul of Alabama, staggered its dynastic run and entrenched himself in Clemson lore. Alabama lost so much on that last-second touchdown. It failed to win back-to-back titles, failed to win an unprecedented fifth national title in eight seasons and ended a 26-game winning streak that had some wondering if its dominance was bad for the sport. Watson will be remembered as Alabama’s saboteur. He delivered all night with aplomb, overcoming two Clemson turnovers—a bad snap and Wayne Gallman fumble—and a lethargic first half. Watson led Clemson to 21 fourth-quarter points, including an equally impressive drive with 6:33 remaining when the Tigers trailed 24–21. He sandwiched a pair of runs around a 17-yard completion to Leggett and a 26-yard deep ball to Williams. A personal foul on Alabama’s Da’Ron Payne tacked 15-yards on that catch, and Wayne Gallman tumbled one yard into the end zone to deliver Clemson the 28–24 lead. The Tigers were able to avenge Alabama’s 45–40 victory in the title game last year. That game swung when Saban decided to onside kick nearly five minutes into the fourth quarter with the game tied at 24. Saban’s decision reinforced what had been obvious all night, that Watson served as kryptonite to the Crimson Tide defense and the only way to stop him was to keep him off the field. Watson torched the Crimson Tide defense for 405 passing yards and played one of the most unforgettable games in championship history. Still, it wasn’t enough. On Monday night, Watson and the Tigers needed to dig out of a hole after a gamble by Swinney backfired in the first quarter and left them playing catch-up for the entire first half. Swinney elected to go for it on a fourth-and-one on the Alabama 41-yard line instead of trying to pin the Crimson Tide deep. A questionable pitch play to tailback Gallman resulted in no gain, and three plays later Alabama opened the scoring. Scarbrough plunged into the end zone on a 25-yard touchdown run, a stretch run that Howard sealed perfectly with a block on the edge. Swinney’s coaching gaffe allowed Alabama play caller Steve Sarkisian to get comfortable after the Tide went three-and-out on their opening possession. Taking over after Lane Kiffin’s stunning departure following the Peach Bowl, Sarkisian settled into a groove early by pounding the ball to Scarbrough, the very strategy Kiffin was criticized for not doing the week before. Scarbrough is Alabama’s punishing sophomore tailback, who is listed on the roster at 6’2” and 228 pounds. But the reality is that listing Scarbrough at 228 pounds would be like labeling William “Refrigerator” Perry “chubby” or Bill Belichick “focused.” Scarbrough added a second score before halftime when he high-stepped down the right sideline on a 37-yard run. That staked the Tide out to a 14–0 lead, with Clemson spending the majority of the first three quarters scuffling to keep the game within two scores. But Scarbrough went out of the game with a lower leg injury with 2:19 remaining in the third quarter, and Alabama lost its hold on the game. And in the end, orange and blue confetti fell on the field after Clemson captured a generational victory for its fans, a win that, for at least one night, slowed down this generation’s best program and boosted another into the championship spotlight.